There is something very moving about seeing your flag fly in another country. On a day to day basis while living in a foreign country you don't really think about what you are missing at 'home'. You enjoy the moment...where you are...the people around you. But seeing the flag fly is a reminder of home and it triggers the memory of all you love about America. Turning on to this little street every July and seeing the flag waving in the breeze could make me feel just a little bit teary eyed. This year we're celebrating with friends...from England. Like us, they are living back in America now. And the sun is shining. Finally. It's gonna be a good day. I got a little emotional looking at the photo...There is something very special about what our flag represents and to see it flying along with the British (?) ones is beautiful. I dropped down and was reading other posts - the one about the supersizing of food is "telling"! Sometimes it takes someone outside of the country to call us back to reality! Welcome back home - and I pray for protection and minimal damage for your possessions. Joyce I pray today is a bit better than the last and that things come together for you to be settled home soon. Enjoy your weekend! What a great village you lived near that would put all those American flags up on the 4th of July. Our friends here invited us to a barbecue this evening and, much to our surprise, their was an American flag up on their patio. It was one of the sweetest gestures and it moved me deeply. Especially since he took the time to order it online just for us on this day. Hope you had a good 4th of July back in the USA. Glad you had a nice 4th back in the USA! I sure hope your furniture arrives soon, so you and your hubby can get settled! Love & blessings from NC! I'm glad you all had an enjoyable 4th here in the good 'ole U.S.A! Hello, I'm visiting from Steph's site, Red Clay Diaries. 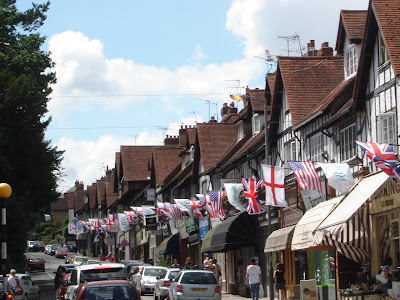 The picture from England is so wonderful...how important that small reminder of home must have been to you on other Fourths of July when you were gone. Today we were driving around the Cotswolds, near Bibury, when we saw a balloon with an American flag design flying outside a pretty cottage. We took photos. So cool to see days even after the 4th.